To inform and optimise our strategy, we undertook four major research projects in 2015 focused on supply levels, anticipated demand, customer profiling and consumer demographics – the latter specifically to understand the emergence of the black middle class and its positive impact on the consumer profile. Based on our research, we believe there is sufficient demand to develop a 60+ property portfolio across South Africa’s major cities as part of our current five-year plan. Our business plan for Storage King is guided by our strategic and long-term focus on growing and optimally positioning our UK property portfolio. 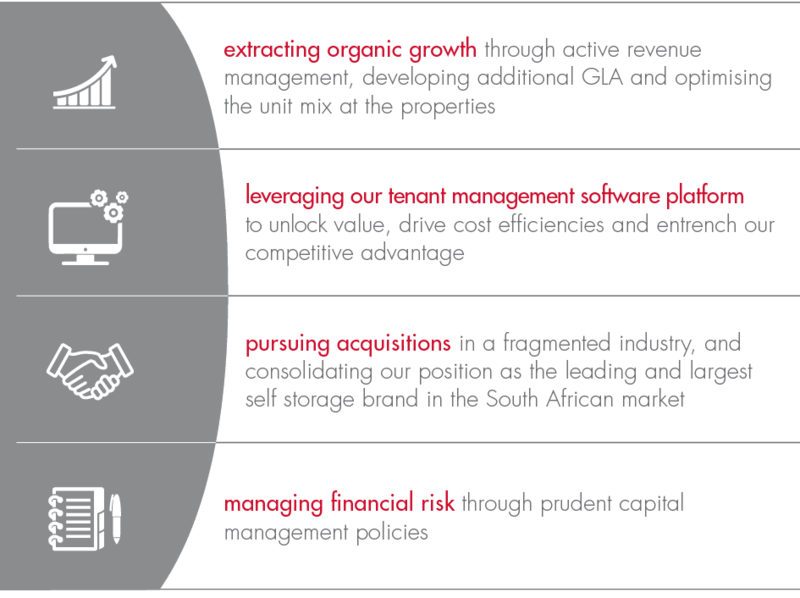 Post-acquisition, we focused on key high-impact foundational areas to position Storage King optimally for future growth. This included identifying Stor-Age head office support services for full integration into the Storage King platform. In addition to the property strategy outlined below, we also developed and implemented a marketing strategy to boost Storage King’s online visibility and drive the optimisation and reach of all marketing initiatives. In the medium term, we have aligned our strategy for the UK market with our current five-year growth plan ending in 2020. The strategy seeks to grow the portfolio through a combination of acquiring existing self storage properties, and developing new properties in key target areas. We have identified a growth target of three to five properties per annum. Storage King maintains a flexible approach to leasehold and freehold property ownership, which enables it to grow the business, secure prime locations and position the portfolio optimally. While Storage King’s approach to leasehold property valuation is based conservatively on future cash flows until the next contractual lease renewal date, it has a demonstrable track record of successfully re-gearing leases several years before renewal. Storage King benefits from the Landlord and Tenant Act, which protects its right of renewal except in the case of redevelopment. In addition, the vast majority of Storage King’s leasehold properties are located in retail parks and/or have building characteristics that make their current usage either the optimal or best use of the property. Furthermore, as property investors, Storage King’s landlords value the quality of Storage King as a tenant and often extend the length of the leases in their portfolios. This enables Storage King to maintain favourable terms. Ultimately, maintaining a flexible approach to leasehold ownership as part of a broader portfolio assembly strategy has allowed Storage King to operate from properties that would have been unavailable otherwise.